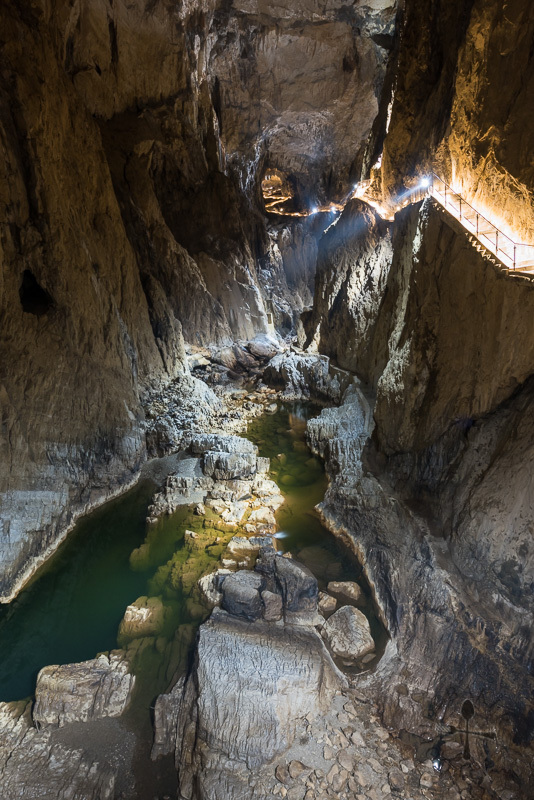 Škocjan Caves (Škocjanske Jame in Slovenian) is a massive cave system in south-western Slovenia. 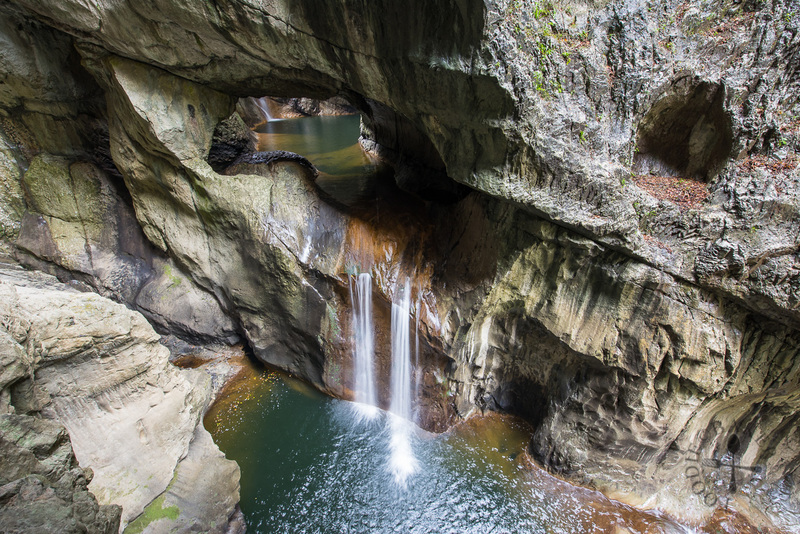 Included in the UNESCO list of world heritage sites on 28 November 1986, the cave system was created by the Reka River, which flows from 50 kilometres on the surface and then sinks into the karst underground, resurfacing again, 34 kilometres away, at Timavo Springs near the Gulf of Trieste. The Škocjan Caves Park’s ticket office (information centre) and car park is located at these coordinates: 45.663195, 13.989329. If you are renting a car, just use Google Map to reach the place – there is free parking available at the park for cars and buses. To save on data, use Google Map to download the offline map of Slovenia when you have access to WiFi. If you need a SIM card, you can consider getting the Visitor Sim offered by Si.mobil, which provides 15 days of 10GB internet access at 15€. If you are getting there via public transport, take a train from wherever you are to a small town called Divača. From May to October, free shuttles buses are provided Divača but on very limited schedules. Though the Park’s website did not offer any official information, a photo of the schedule can be found here. If there are no shuttles buses available, you will have to walk about 35 to 45 minutes to reach the ticket office (no taxis available around the area too). The ticket office (information centre), a souvenir shop, a restaurant and toilets are located close together next to the car park. Free lockers are also provided to store luggage. Do note that there are no toilets available along the hiking routes. This hiking route is open all year round, but it is compulsory to join a guided tour. You will be allotted a time slot by the ticket office personnel. 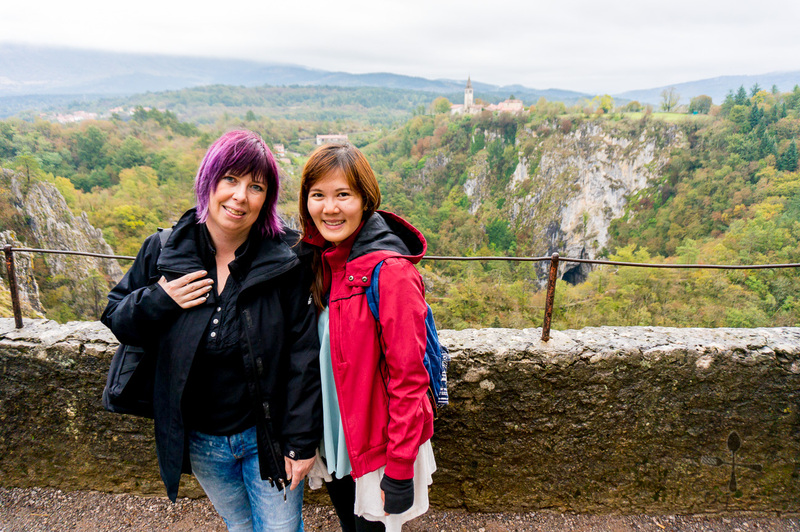 The tour is conducted in Slovenian and English, though most of the time German and Italian guides are also available. Photography is not allowed throughout the entire hike/tour. 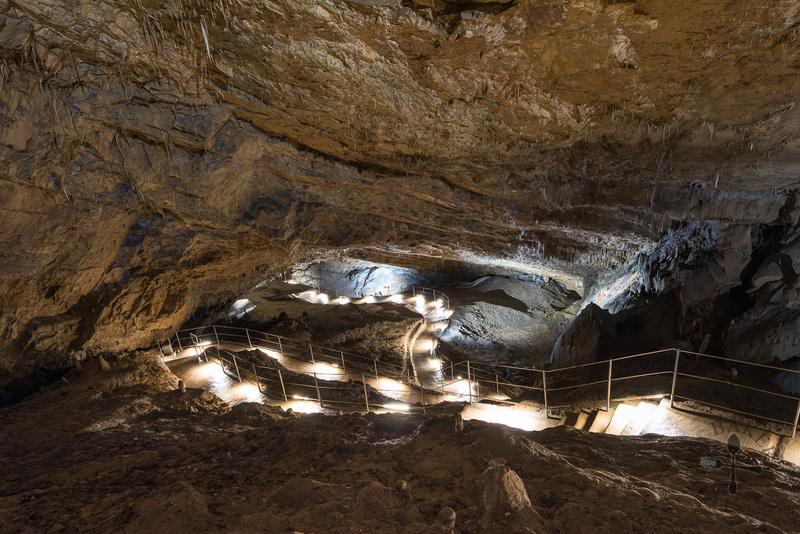 The cave was originally in total darkness but because to open up the cave for travellers, lights are installed in the cave. 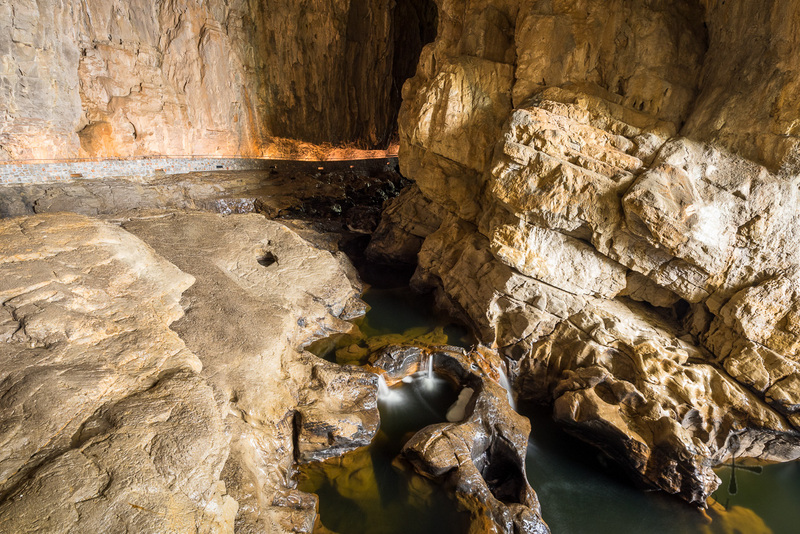 The presence of light, carbon dioxide produced by humans and the high humidity already present in the cave resulted in the growth of green-coloured mould that was originally absent in the cave. As such, to prevent further deterioration, a photography ban is imposed. 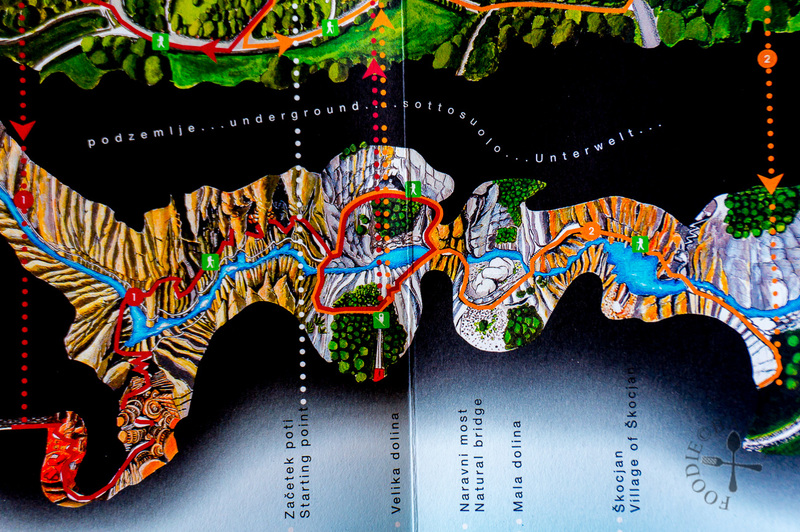 The hike starts at the ticket office and ends at Tominc Cave (Tominčeva Jama), where travellers can either take a funicular or hike up to the ticket office. This hiking route is closed during the winter months (November to March). For the rest of year, a guide is compulsory except for June, July and August. Student volunteers will be stationed along the hiking route during these 3 months to guide travellers and to provide general information about the place. Photography is allowed for this hike. The educational trail is open all year round, free for all to visit and photography is allowed. 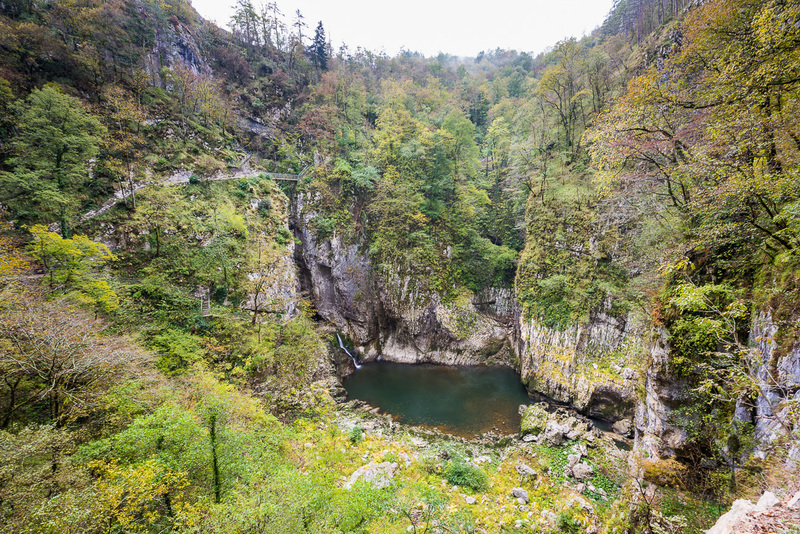 The trail is circular, allowing travellers to walk around the Big Collapse Doline (Velika Dolina) and Little Collapse Doline (Mala Dolina) and through the villages Betajna, Škocjan, and Matavun. Map and details of the trail can be found here. Due to our tight schedule, we didn’t manage to do this hike. *If you have a huge group of at least 12 people, you can arrange for a tour with the Park for a nominal fee. We learned that if travellers purchase tickets to do both Hiking Routes 1 and 2, travellers will do both hikes at one go instead of having to wait for the other tour to start. Starting at the ticket office, travellers will do Hiking Route 1 first. At Tominc Cave, instead of coming up via the funicular or hike up, travellers will continue on to Hiking Route 2 in the opposite direction. Because the Hiking Route 2 is now done in reverse, it will be a bit more physically demanding as it is uphill most of the way. However, we are not sure if this arrangement is available all the time, so it’s best to check with the ticket office directly. Prices are accurate as of July 2017. For latest prices, please check with the official website. From the ticket office, we walked about 10 minutes (about 500 metres) to the entrance of the hike through a small path in the woods. It was pouring while we were walking there so we couldn’t stop to take any photos. When we reached the entrance of Hiking Route 1 in the Globočak Valley, Nancy took out a key to unlock the entrance and we entered a man-made tunnel through the Globočak Collapse Doline (the entrance was locked promptly after we entered the gate). We headed deeper and deeper into the cave through the 116-metre long man-made tunnel while Nancy explained to us the formation and history of the Škocjan Caves along the way. Soon we reached the end of the tunnel and Nancy took out a key to unlock the next section of the tour (or rather, the beginning of all the amazement) – the Silent Cave (Tiha Jama). 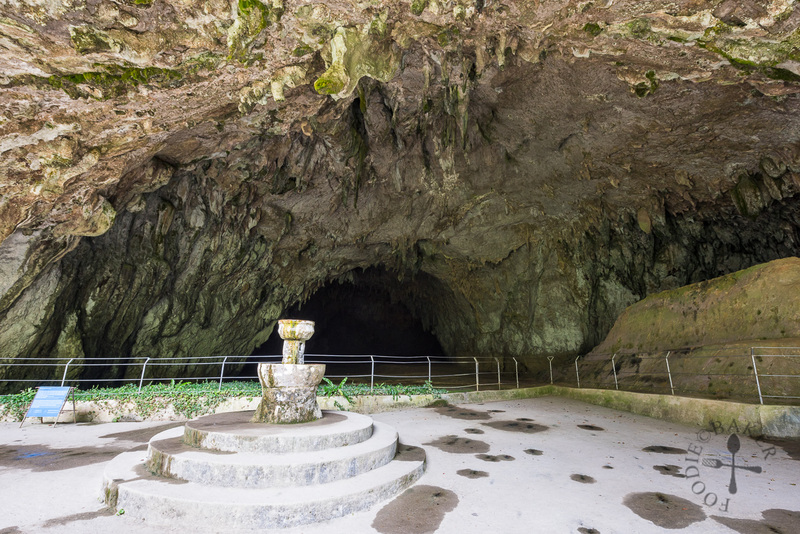 About 60 metres below ground, the Silent Cave was discovered in 1904, and it is a stalagmite and stalactite heaven. 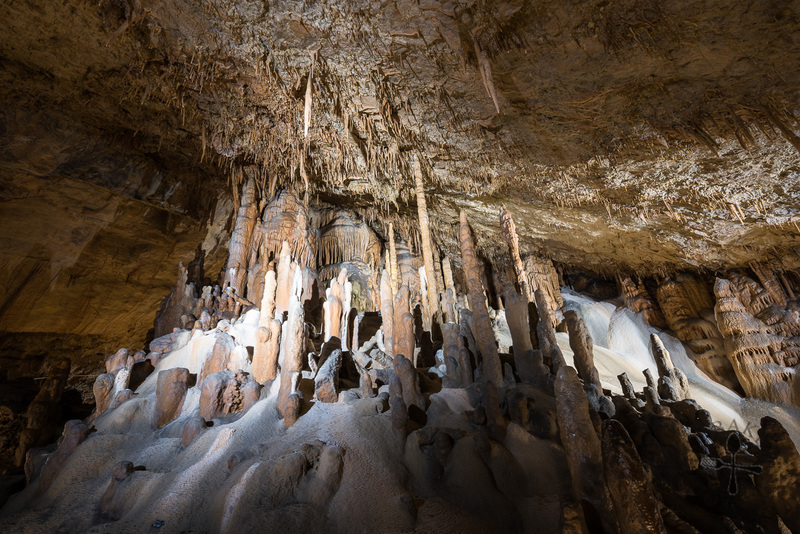 The cave was adorned with massive stalagmites and stalactites that are formed many thousands of year ago – and they are still growing today! Just like its name, the Silent Cave is so quiet that only our footsteps could be heard, and unknowingly I lowered my voice to a whisper while inside this cave. Stalactite hangs from the ceiling while stalagmite grows from the floor. 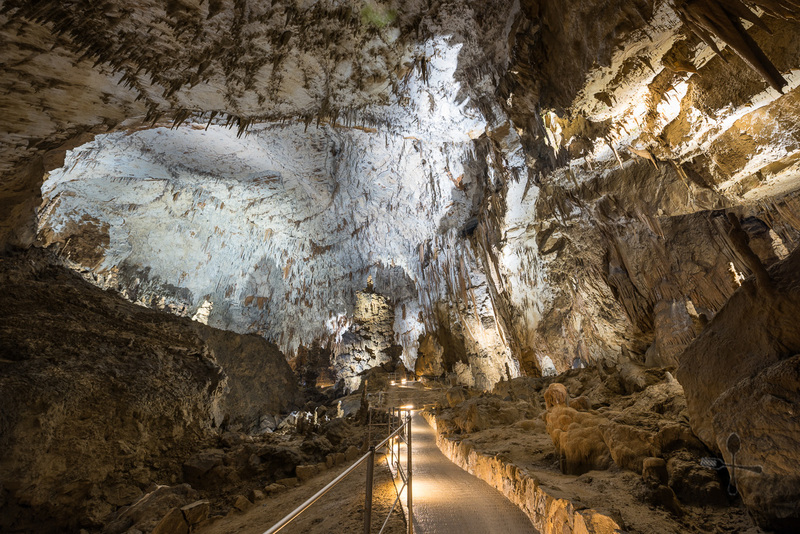 When water containing minerals (usually calcium bicarbonate, aka limestone) dripped through a cave’s ceiling, some of the minerals are deposited in the ceiling. As more and more minerals are deposited, it will result in a cone-shaped formation, which is called a stalactite. Most stalactites will have pointed tips. 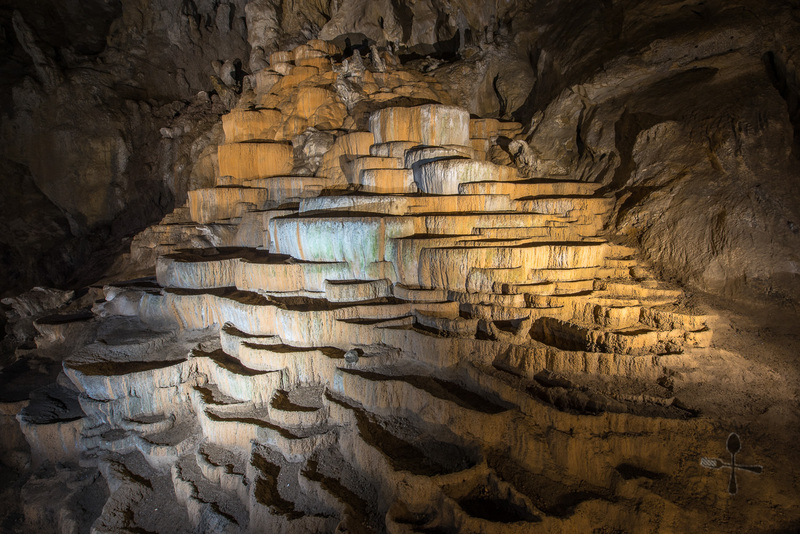 When water drips onto the floor of a cave depositing minerals, over time, mounds of mineral deposits will form, producing a stalagmite with a rounded or flattened top. 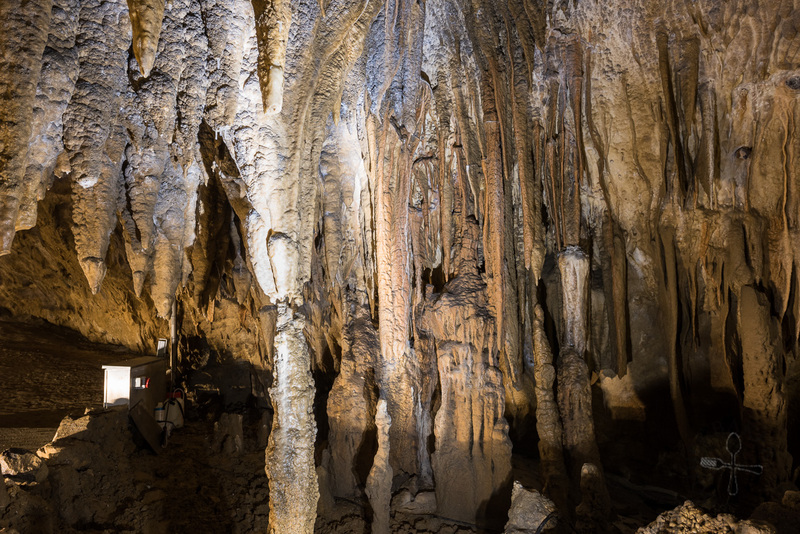 When a stalactite and stalagmite joins together, it is called a pillar or a column. 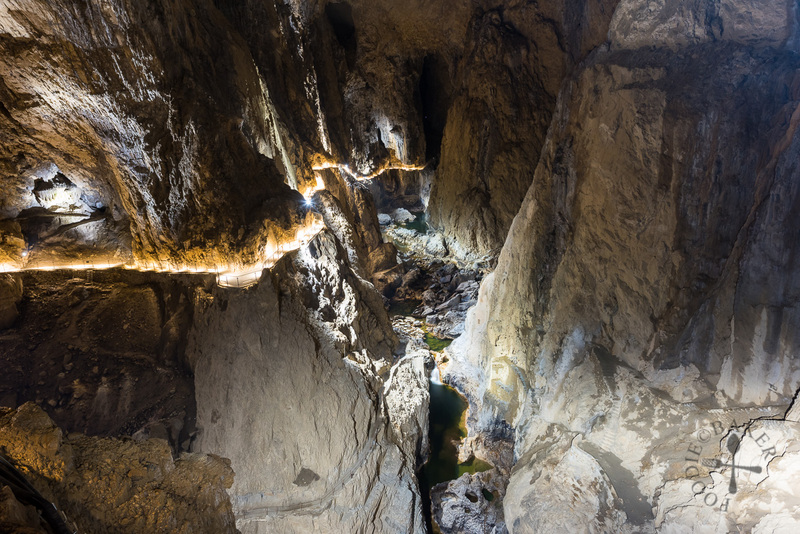 Depending on the rate of water dripping through the cave, stalagmite and stalactite grow at an average rate of 1 centimetre every 100 years – hence it is extremely important that we do not disturb or destroy any of these natural formations, because it will never restore to its original state during our lifetime. The Great Hall is located at the end of the Silent Cave, a 120-metre wide and 30-metre high large hall with growing stalactites and stalagmites everywhere. 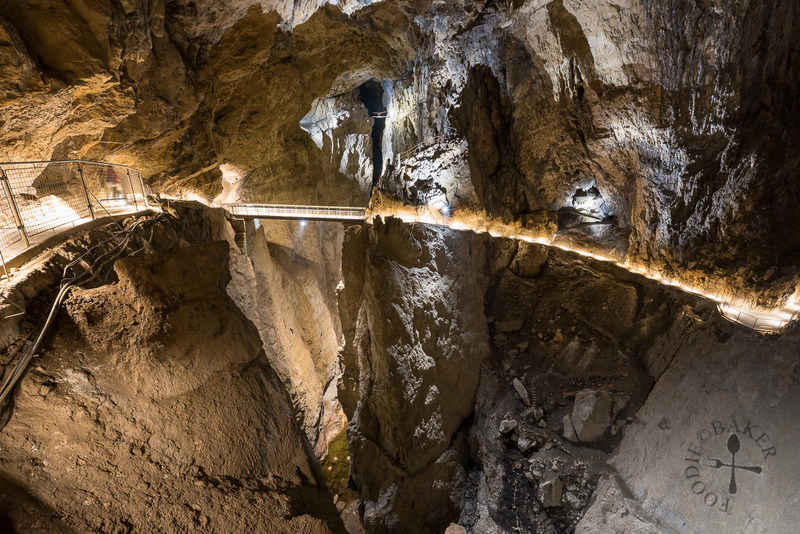 To strike a balance between tourism and conservation, Škocjan Caves Park uses minimal lighting to light up the cave, which was originally in complete darkness. 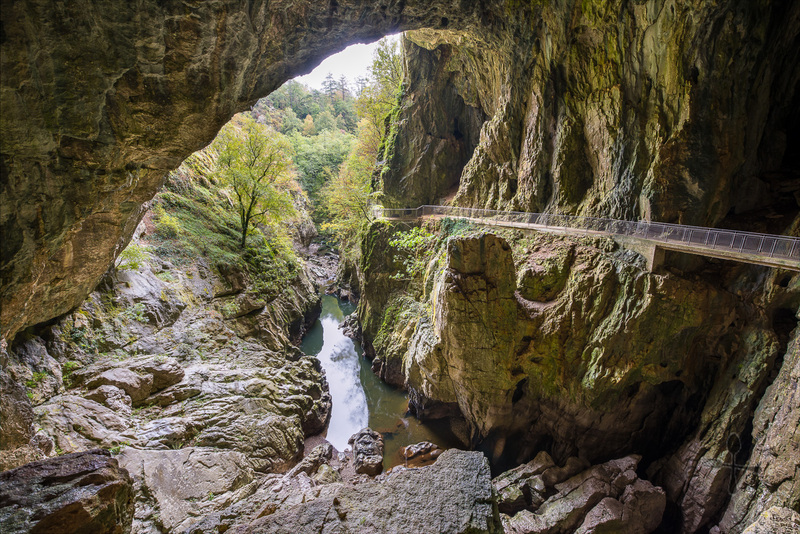 As we left the Silent Cave, we entered a new cave – the Murmuring Cave (Šumeča Jama), where we could hear the faint roaring of the Reka River. 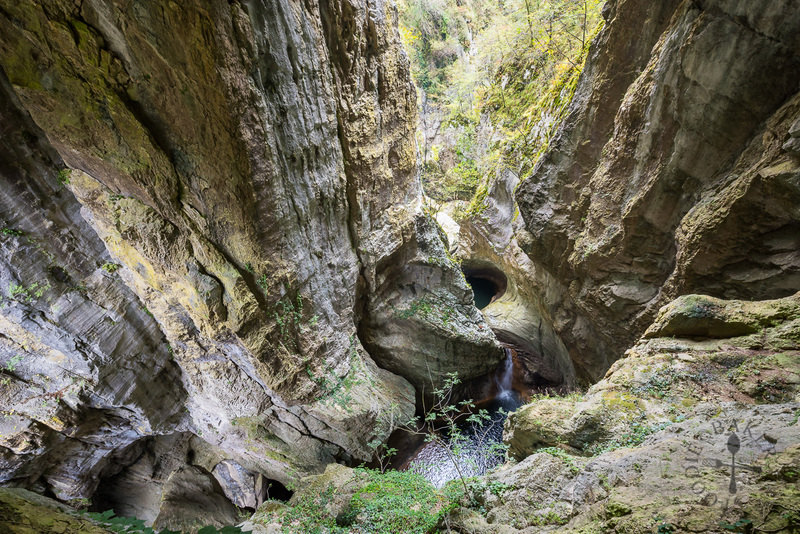 The cave was 300 metres wide and 100 metres tall, and we were approximately 40 to 50 metres above the Reka River. The view was simply stunning because one could have never imagined an underground canyon so huge! The sheer massiveness of the canyon was enough to blow us away. And if you look carefully in the above photo, you could see remnants of old paths and steps that are a lot closer to the river and they were a lot more cliff-hugging. The old paths were destroyed by floods caused by heavy rains, hence the paths today were built higher. While water levels from the floods usually reach up to 30 metres, the record water level was 132 metres. What goes down must come up – after descending deep into the cave, we gradually walk the steps back out to the light. We passed by an ancient Tominc Cave (Tominčeva Jama), where it was determined that the cave was visited and settled in the Neolithic, Bronze, Iron and Roman ages. Significant archaeological discoveries – such as stone, ceramic and copper tools, fragments of amphora, glass vessels and metal finds, and even skeletons of young people – were made. 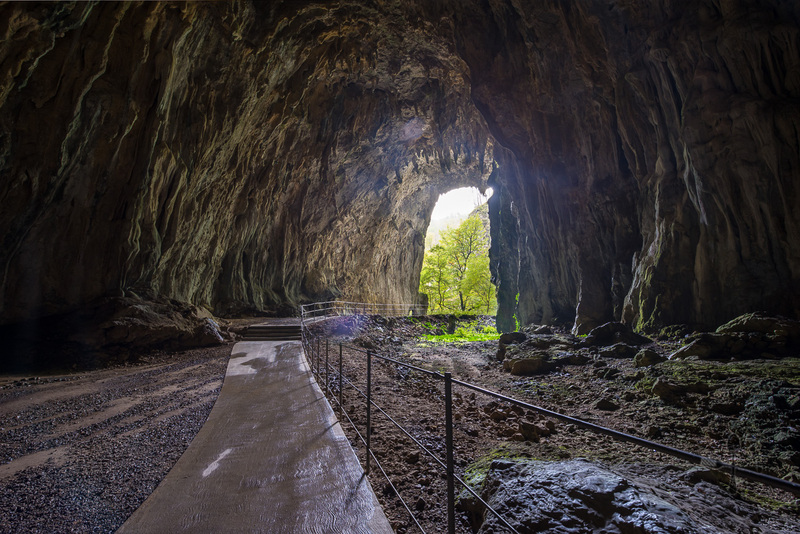 The findings indicated that the cave was probably used as a religious and mythological place in the past. 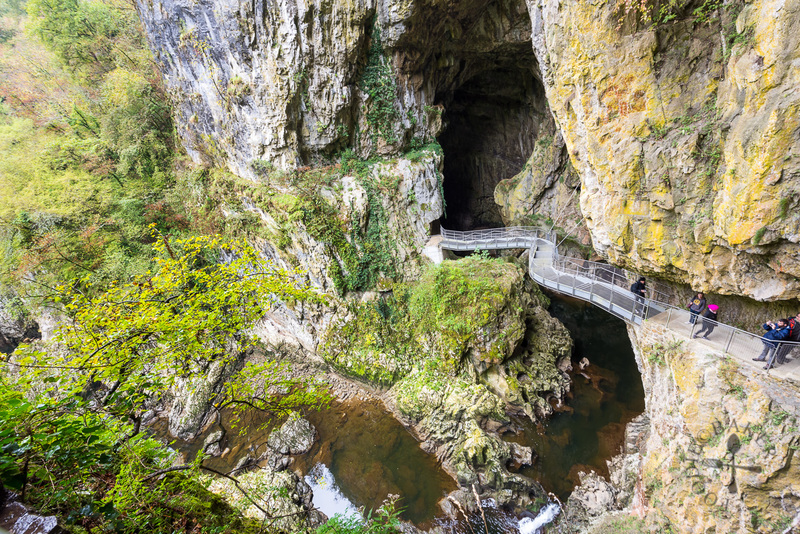 The cave was named after Matej Tominc, who commissioned the construction the first tourist path to Big Collapse Doline (Velika Dolina), completed in 1823. The structure in the foreground is a well, constructed in 1889, dedicated to Viennese Karstologist, Franz Kraus. 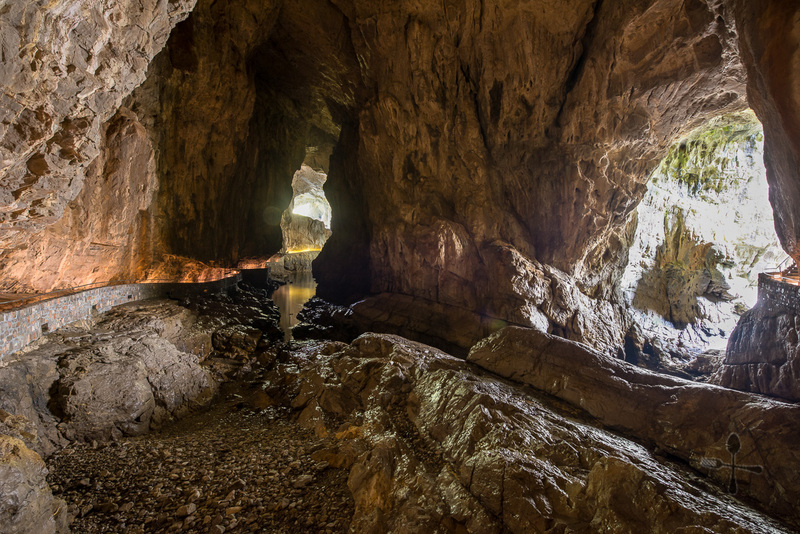 The Tominc Cave is also the ending point for both Hiking Route 1 and 2 (if the hikes were done separately). We continued onto Hiking Route 2, towards Little Collapse Doline (Mala Dolina). Being out in the light, photo-taking was much easier as compared to when we were in the caves. 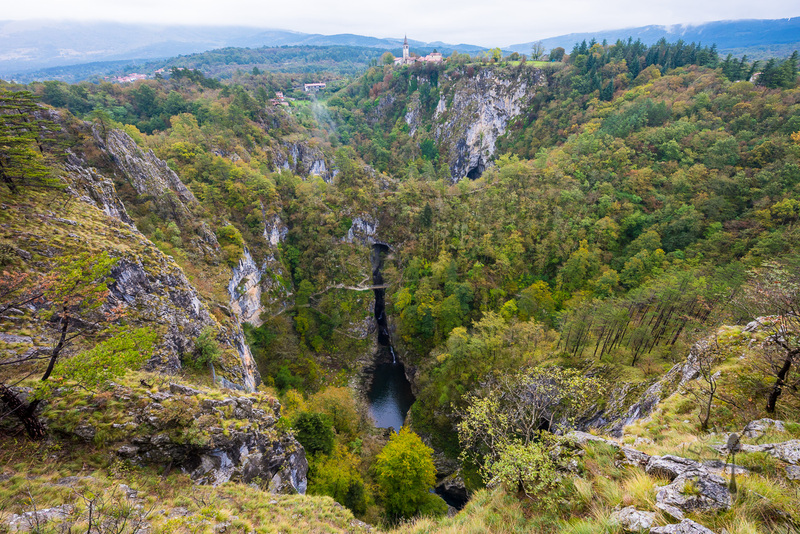 The above photo was a popular photo stop where the Reka River spills into a lake through a canyon, under a natural bridge. On days when the water flow is heavy, it can be a quite impressive (and noisy) sight. 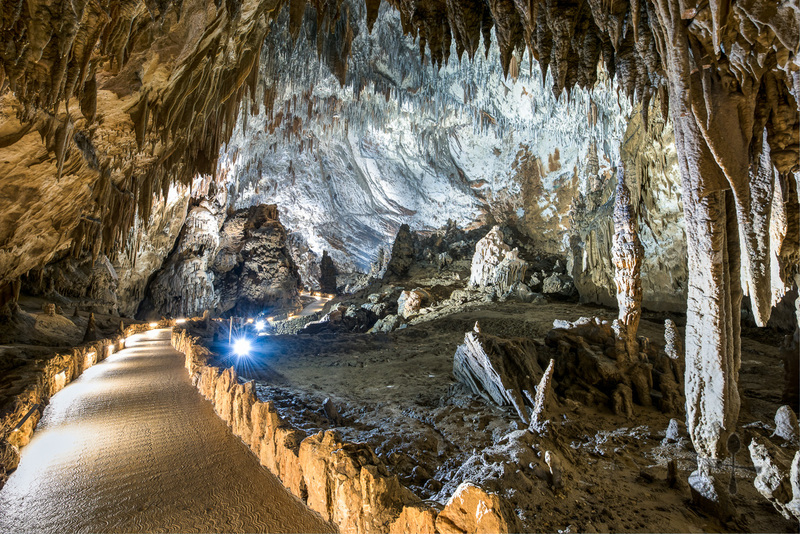 The Mahorčič Cave (Mahorčičeva Jama) was named after a local explorer who was also the mayor. 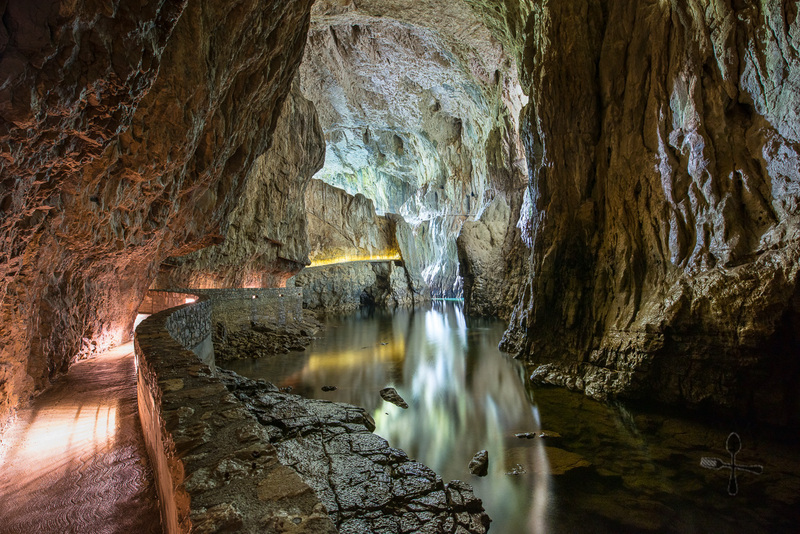 The cave sits directly below the Škocjan village and is also where the Reka River enters the cave system. The sunlight streaming into the cave makes for an absolutely scenic shot. A huge thank you to Nancy for bringing us around! Go early. The number of travellers increases at later timings. I’ve also read that if there are too many people and there are not enough guides, the ticket office may slot you into a later timing. So go early or be prepared to hike around the area (like Hiking Route 3) while waiting for the tour to start. Bring a jacket and wear good hiking shoes. Temperature inside the cave ranges around 9 to 12 degrees Celsius all year round, so even if it’s summer, it’s good to have a jacket on hand. There are some slopes and steps during the hike and the paths may be wet at times, so it’s good to be equipped with a pair of good hiking shoes. Moderate difficulty. The hike involves quite a bit of slopes and stairs, so it may be suitable for those with injury, knee or walking problem. Some travellers also mentioned that certain parts of the hike can be vertigo-inducing but we didn’t experience any (maybe because we are not that scared of heights). And that’s it for today’s travelogue, stay tuned for the next travelogue! 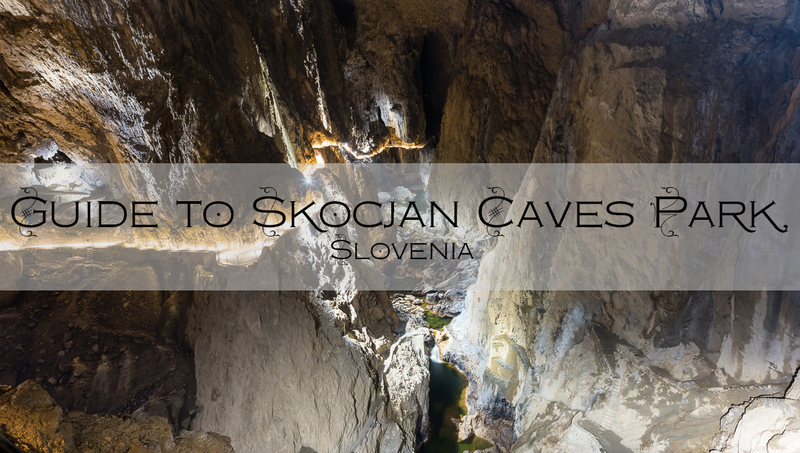 Full disclosure: We were granted permission by Slovenia’s Ministry of the Environment and Spatial Planning to take photos in the caves. Our trip to Škocjan Caves was not sponsored in any way though Škocjan Caves Park had arranged a guide to help us tour the caves. All experiences and photos, unless specifically stated, are our own! I am definitely adding this place to my bucket list. What a breathtaking place. Thank you, thank you for beautiful pictures and wonderful report of my country…. 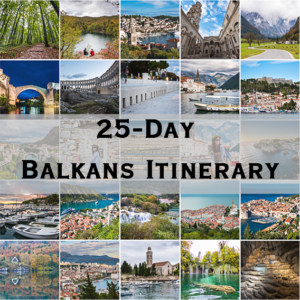 Hi Xenia, thank you so much for stopping by the blog, my husband and I had an amazing time in Slovenia last year, your country is beautiful! Hi Anna, I’m glad I brought you on a virtual trip 🙂 Hope you can get a break from work soon, take care!